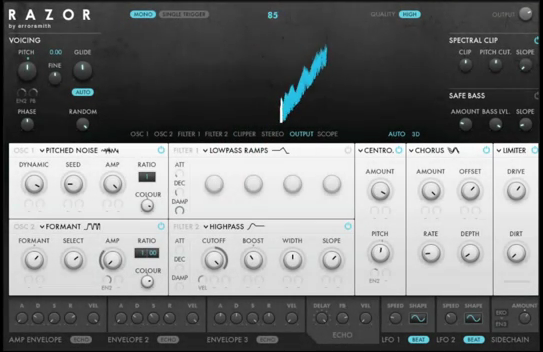 Native Instruments posted a teaser video on their new additive synth called Razor. The factory patches are by Richard Devine. It reminds me of Image-Line’s Harmless as it shares a simplified approach to additive synthesis with subtractive filters on the back end. They have upped the ante with waveform visualizer which seems quite nice. Yeah, the patches sound great in the demo. If the price is right I’d consider it but knowing NI it might be a bit steep for those of us who have this ground covered. You can’t go wrong with ACE or Tyrell (especially since that one is free), but patches by Richard Devine sure gets me excited. Yeah, I’m all set on this front as well. Just wanted to report it out. Personally, I love Camel Audio Alchemy for this sort of thing. The visuals in the video were definitely cool. Having been burnt by the Tron game for the Atari 2600 that had an awesome box, but the game was terrible-looking it makes me wonder what makes this specific VST any better than plunking down some cash for ACE or holding your breath until Tyrell is out of beta?